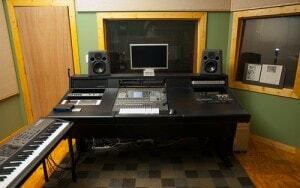 Ovation Sound is a recording studio in Winston-Salem, NC owned and operated by Evan Richey and Bill Stevens. A haven where creativity flows freely – where ideas become entities. Ovation Sound is EVERYTHING audio. Evan Richey and Bill Stevens are musicians, arrangers, producers, composers, songwriters and recording engineers. We are comfortable in whatever roles best fit your needsWe produce artists and bands with musical styles ranging from Handel to Hip Hop. When you choose Ovation Sound, you choose a partnership with educated professionals who take pride in their craft and your final product. As musicians ourselves, we know the importance of checking out a recording studio, testing the gear and meeting the sound engineers can be before committing to recording your next album. Ovation Sound has two recording suites and multiple isolation rooms to accommodate any configuration your project may require. Ovation Sound has years of experience in Automated Dialogue Replacement work in television and film. Our knowledge of the software, ability to read scores and understand dynamic and emotional nuance gives us the edge as editiors.